The installation of SSD’s in MacBook Pro’s happens on a daily basis here at the hardwrk office. Therefore we have been playing with the idea of building the world’s fastest MacBook Pro with an SSD-Raid-0 for some time. We wanted to know how fast you could get the machine by using only standard components. After initial tests with different Raid setups and some failed attempts we bundled our know-how and built the ultimate killer machine: the hardwrk SSD 830 biturbo. The monstrous power of a 13″-MacBook Pro combined with 16 GB DDR3 RAM and a 1 TB-Samsung 830 SATA III SSD as the biturbo’s heart bundled in a Raid-0. To put it short: the ultimate rocket machine! And the best thing about it? You can win the world’s fastest MacBook Pro! Building the fastest MacBook Pro really isn’t complicated at all. You just have to buy a few MacBook Pro’s, a whole bunch of SSD’s and a hardwrk adapter kit to test it. After a few weeks of investigation and research, drinking coffee / Club Mate by the gallon and unnumbered installations of Mac-OS-X you finally get the SSD-Raid-MacBook Pro rocket! The biggest obstacle in all this was the unclear SATA III compatibility in Apple’s MacBook Pros on the DVD drive’s SATA port. Since the use of this port is not intended by Apple we needed to painfully test this out and came to some interesting conclusions during this process (See info box SATA III in MacBook Pro). 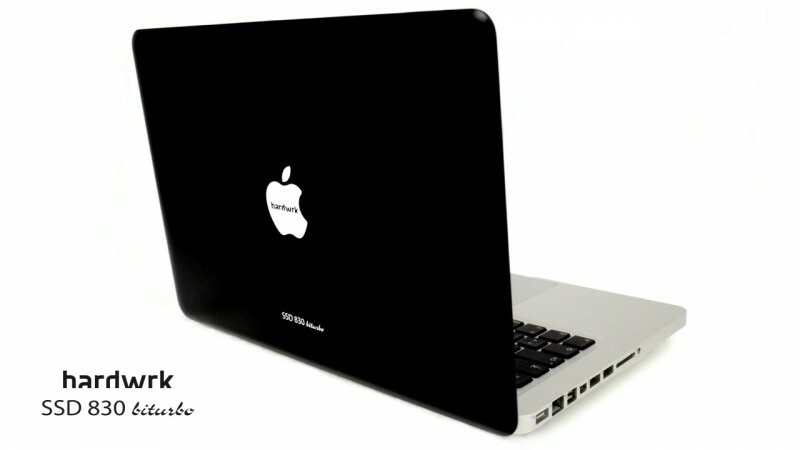 The MacBook Pro generally supports SATA III on the HDD SATA port since version 8.1 (early 2011). The port of the optical drive supports SATA III since the „late 2011“ models (same version number). The peculiarity though is that SATA III only works stable on the optical drive’s port in the 13″ MacBook Pro. The 15 and 17′ models have significant problems with SATA III SSD/HDD on the optical drive’s port. For the time being, it is not clear if this malfunction will be resolved by a firmware-update by Apple or if this is even caused by a cable which does not specify for SATA III. In order to win the hardwrk SSD 830 biturbo, you have to at least write a comment at the bottom of this blogpost about why you want to win this badly and in addition share our campaign (Twitter, facebook, Google+). Everybody who participates will take part in the drawing of the hardwrk SSD 830 biturbo. Please attach the link to your social media share and a valid email address that we will be able to contact you -> otherwise you will not participate!! Deadline is April 20th 2012, so be fast! We’re looking forward to your extroverted statements! A special thank you goes to Samsung who were so kind to provide us with the SSDs to make this happen. Thanks for participating! Our contest is closed now!! We will publish the winner of the hardwrk SSD 830 biturbo during the next week and update this blogpost soon.